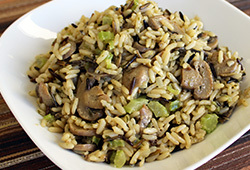 Mahatma Long Grain and Wild Rice Mix is a traditional holiday favorite, however, it also gives an everyday meal that special touch. 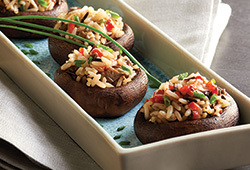 This is the perfect blend of long grain rice and wild rice with onions, garlic, celery and mushrooms, herbs and spices. This is a side dish with sophisticated taste and texture enhancing any meat or seafood entrée and makes the perfect Holiday stuffing. Bring 1-1/2 cups of water and 1 tablespoon margarine to a boil in a medium saucepan. Stir in rice mix. Cover, reduce heat and simmer for 25 minutes. Fluff lightly with fork and serve. 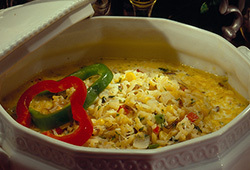 In a 1-1/2 quart microwave safe dish, combine 1-2/3 cups hot water, 1 tablespoon margarine, and rice mix. Cover and microwave on HIGH for 3 minutes. Reduce setting to 50% power and microwave for 22 minutes. Fluff lightly with fork and serve. If your microwave does not have variable power settings, follow manufacturers directions. Not a significant source of saturated fat, sugar, vitamin A and vitamin C. Percent Daily Values (DV) are based on a 2,000 calorie diet. 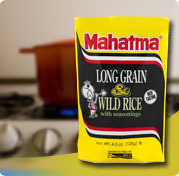 Enriched Long Grain Parboiled Rice [rice, niacin, iron (ferric orthophosphate), thiamin (thiamin mononitrate), folic acid], Wild Rice, Long Grain & Wild Rice Seasoning [Maltodextrin, Salt, Monosodium Glutamate, Dehydrated Vegetables (Parsley, Mushrooms, Garlic, Onion), Dextrose, Partially Hydrogenated Soybean Oil, Silicon Dioxide (prevents caking), Caramel Color]. Contains Soy.